Matthew Freeman is an Associate Professor in Environmental Health at the Rollins School of Public Health at Emory University. The Rollins School of Public Health at Emory University is a top-ranked public health program located in Atlanta, Georgia, USA. Our work focuses on enteric disease transmission, behavioral outcomes, equity and gender, and educational outcomes all over the world. The Soil-Transmitted Helminthiasis Advisory Committee shares its challenges and recommendations to the control and elimination of STH as a public health problem following their annual meeting in 2017. Global, regional and country estimates for handwashing with soap after potential faecal contact. Andilaye endline data collection has begun! This dream team of enumerators, field supervisors, and Andilaye staff (Melkamu and Mulat) will be visiting over 1,500 study households within the next 40 days to conduct surveys on WASH behaviors and mental well-being - as part of the Andilaye Impact Evaluation. Congrats Dr. Chard! Next stop, an Epidemic Intelligence Service fellowship at the CDC! The Andilaye team is conducting another round of refresher trainings with community health volunteers. Here, the health extension workers of an intervention kebele are demonstrating a household counseling visit. Check out that PhD dissertation! Congrats Dr. Delea! 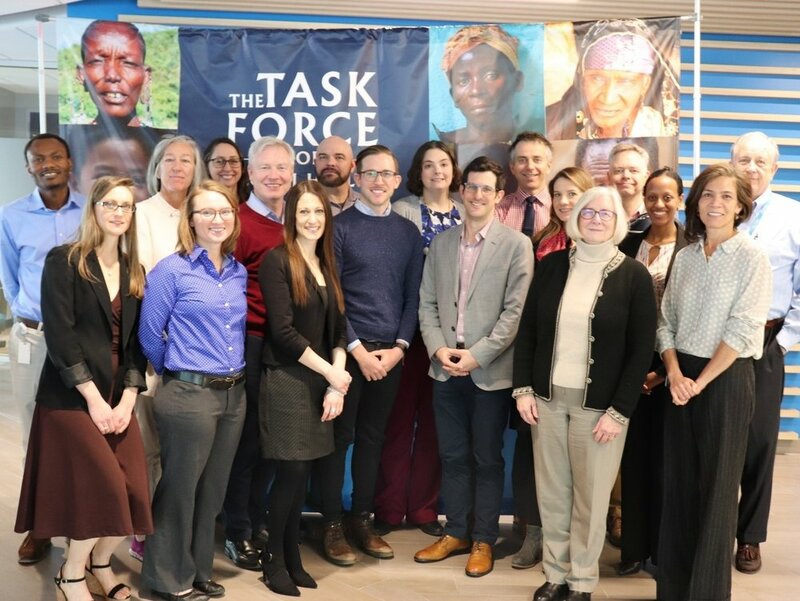 Matt, Maryann, and Jed attended an “F in SAFE” strategic technical meeting at the Task Force for Global Health to discuss and propose next steps for a methodology that reliably measures “clean face” in the context of trachoma programs and operational research. Our Andilaye team hosted a regional workshop with Amhara project stakeholders to discuss progress of the intervention in study communities. Here, a health extension worker shares her experience with the intervention activities thus far. Throughout December and January, we visited Andilaye communities to learn more about how the project is being received by influential community members. Here, our project Monitoring and Evaluation Officer Mulat Woreta is interviewing a community police officer at the health post of an intervention community. Bonheur Dounebaine, Kyra Hester, and Robert Bednarczyk traveled to Dakar, Senegal to discuss the Vaccine Exemplars Project with local partners at the Ministry of Health, UNICEF, WHO and others. The Andilaye umbrellas are here! These in-kind umbrellas (modeled by our regional staff: Mulat, Tigist, and Kassahun) will be distributed to the Health Extension Workers and Women’s Development Army Leaders to help shade them from the strong sun as they conduct the Andilaye household counseling visits with caregivers. Matt and staff from the Emory Ethiopia team (Dr. Abebe, Kassahun, Mulat, and Tamiru) enjoy a cup of coffee in Addis as they prepare for the NNN 2018 annual conference. The Andilaye project was highlighted in a WASH-NTD panel discussion during the conference. 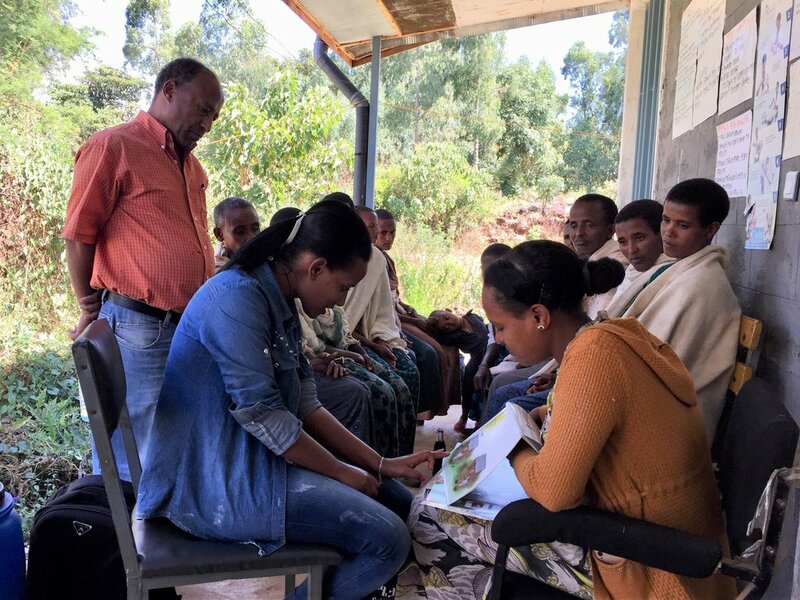 Ashlin Rakhra (MPH ‘19) and Tina Braccio (MPH ‘19) both conducted practicums at the Emory University/Ethiopia office in Amhara this past summer. Their projects involved process evaluation on our Andilaye intervention. PhD student, Frederica Lamar, spent this summer collaborating with a veterinarian at Universidade Eduardo Mondlane in peri-urban Maputo, Mozambique to identify key high risk behaviors contributing to childhood exposure to chicken feces. Here, she is conducting an interview as part of formative research to gain an understanding of the value chain related to chickens. 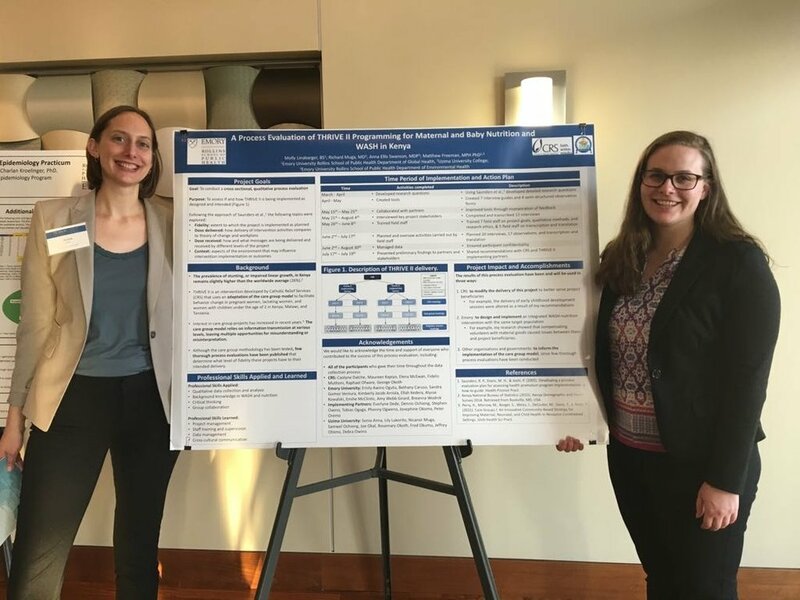 Congratulations to Breanna Wodnik (MPH ‘18) for being awarded the Eugene J. Gangarosa Award for Excellence in International Health! This award is presented to the graduating student who has demonstrated a creative approach to solving public health problems and who shows promise for outstanding service in the international arena. Congratulations to Anna Chard, a PhD Candidate in the group, whose paper on “The impact of WASH improvements on infections disease using serum antibody detection” was accepted as a finalist for Best of UNICEF Research 2018! Anna’s paper shows that dried blood spot (DBS) collection provided objective evidence of disease at a low cost per antigen analyzed, making it an effective measurement tool for the WASH field. Congratulations to Molly Linabarger (MPH ‘18) for being selected as a finalist for the 2018 Outstanding Practicum Award at Emory University! During her practicum, she led a process evaluation of THRIVE II programming for maternal and baby nutrition and WASH in Kenya. 25 community mobilization and commitment events in the past 30 days. These events are a key intervention activity to Andilaye and focus on improving action knowledge, barrier identification and planning, and attitudes regarding targeted NTD-preventive WASH behaviours through a form of contextually appropriate and interactive edutainment. The events also initiate the process of shifting social norms through community-generated and managed by-laws and sanctions and public commitment thereof. Midline data collection for the Andilaye project has begun! Here our data collection supervisors (left to right: Rosie Abesha, Tigist Abebe, Destaw Asnakew, and Yeseresh Gashu) lead our data collectors to a community to administer midline surveys. The Emory-Ethiopia team is looking pretty sharp in Emory University gear. From left to right it's Yihenew (an Oregon State University PhD Candidate), Resom, Kassahun, and Mulat (Emory-Ethiopia Amhara regional staff). Over the past year, this team has been designing and implementing the Emory-Ethiopia project call project Andilaye (Amharic for togetherness) whose core message is "Together we can be a strong, caring, healthy community." After busy week of field work and meetings with project stakeholders in Kenya, Matt and Jed enjoy a Saturday morning at the Ngong Hills just outside of Nairobi. In January, we kicked off our data collection for the SWASH+ Life Cycle Costing study in 100 schools in Kisumu, Nakuru, Nairobi, and Mombasa counties of Kenya. Here, our data collector Charles Boera inspects a school's latrine block to estimate the cost of repairs. The two-day training for Andilaye household counseling visits have begun. These trainings will take place at in each Woreda (district) involved in the Andilaye intervention (Bahir Dar Zuria, Fogera, and Farta). The trainings are facilitated by Emory Ethiopia Andilaye team members. Health Extension Workers, Cluster Health Center Heads, and the Sanitation and Hygiene Officer and Health Officer will be in attendance from all intervention kebeles (villages). Here, Andilaye team members Siraj and Resom role play a household visit using the household counseling visit flipbook. After presenting their summer practicum projects to THRIVE implementing partner, Homa Hills Community Development Organization, Graduate Research Assistants and 2018 MPH Candidates, Molly Linabarger and Breanna Wodnik, pose for a celebratory picture with our Public Health Program Associate Emily Awino Ogutu in Homa Bay, Kenya. Graduate Research Assistant and 2018 MPH Candidate, Breanna Wodnik, presented on qualitative research methods and electronic data collection to fourth year medical students at Uzima University in Kisumu Kenya as part of her summer practicum and work on the THRIVE project. Behavioral trials for the Andilaye intervention took place in May 2017 in the Amhara region of Ethiopia. 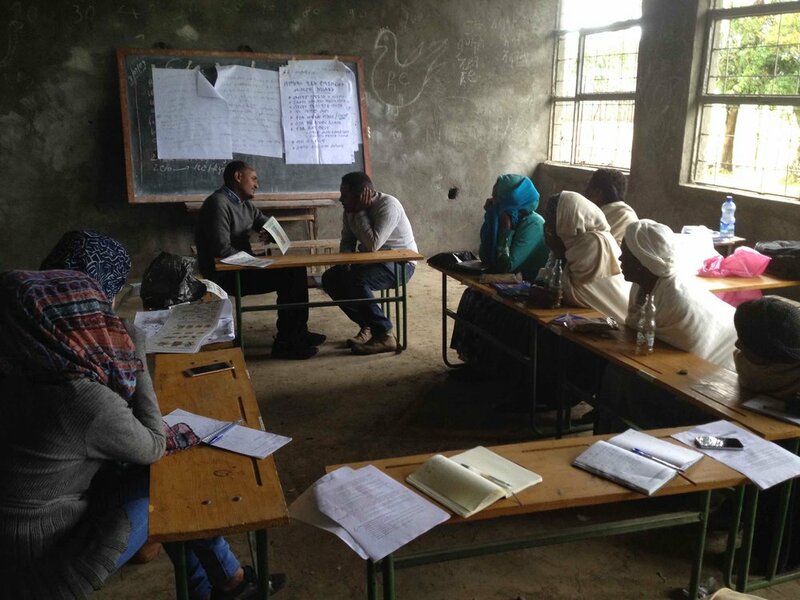 The purpose of the behavioral trials is to test out aspects of the Andilaye intervention, from the overarching approach to the activities themselves, in order to determine what does and does not work at changing sanitation and hygiene behaviors in the Amhara context. Here, our behavior change communication specialist Siraj Mohammed is giving a key note address during a community mobilization and commitment event as part of the behavioral trial. Data collectors for Andilaye get ready for another round of household visits by administering mobile survey in pairs. Mobile surveys developed using the freely available Open Data Kit help to improve accuracy and enable immediate availability of results. Our surveys also contain checks and prompts to limit entry errors during data collection. Baseline data collection for Andilaye is complete! Over the course of 37 days, we enrolled 1,589 households that will be followed throughout the next two years to measure changes in NTD-preventive sanitation and hygiene practices (i.e., behavioral outcomes) as well respondent-reported diarrhea and mental well-being in study communities over time. Here, our study manager Jed Snyder and team of data collectors pose for a celebratory picture. The Andilaye team held an intervention design workshop in Bahir Dar, Ethiopia on April 7 and 8, 2017 with key regional stakeholders. Here, our study coordinator Maryann Delea shares a summary of formative research results along with comprehensive problem and solution trees developed from formative research on sanitation, personal hygiene, and household environmental sanitation. Meeting participants partook in interactive activities to review findings and elicit feedback on target behaviors for intervention design. See the meeting report here. Congrats Jennifer Head! For winning the Rollins Department of Environmental Health Outstanding Research Award for her work with CRS in Ethiopia. Anna Chard presenting on our Mali WASH in schools impact evaluation at the 2016 UNC Water and Health Conference. Maryann Delea presents the concept of measuring collective efficacy to tackle community sanitation challenges at the 2016 UNC Water and Health Conference.